If you would like to print all the instructions and recording sheets together, please use this PDF (4.6 MB). It is also worth keeping a few extra seeds for spares in case of germination failure. • 18 garden canes to support the beans (at least 1.8 metres high). • Scales to weigh harvests. • GROW recording sheets and pencil/pen for observations on the plot (to upload when home). • Gardening tools for preparing the soil, planting seeds, cutting your harvest and watering if you need to. To grow well your crops will need a site that is not water-logged and has good levels of light. If you don’t already have a site where you grow food, you can use two simple tests to identify a suitable site – 1) Testing soil with the squeeze and sniff test, 2) Assessing light and shade. Find out more about these tests here. The total site area could therefore be about 2 metres by 3 metres or a 1 metre by 5 metre strip. You can arrange the plots however best fits your space, but we recommend that the two smaller plots are on the sunnier side (e.g. south) of the two large plots. Once prepared you might like to cover your plots with cardboard or weed control fabric to prevent weeds growing back if you don’t plan to plant straight away. It doesn’t matter if you practice no-dig or have your specific way of growing, but you must remember to treat each plot in the same way: same watering, fertilising, etc. Ultimately, what you want is for the only difference between them to be the crops that you’re growing in them. Otherwise you won’t know if any differences in results are because of the different crops or differences in practice. The standard descriptions below can help describe your plot in a way that is comparable with other people’s. You can print this recording sheet to take outside with you. How much is your experiment plot obscured by trees immediately above it? How much is your experiment plot obscured by shrubs immediately above it? Where is your experiment plot positioned? If your four experiment plots are not all on the same slope, it is valuable to record the slope angle and aspect for each plot. We are going to plant climbing beans which can grow to 2 metres high and need to be supported, spinach which will cover the ground and grow to about 40 cm, and radish, a root crop, the leaves of which will grow to about 20 cm. The polyculture mix will grow in a 1 metre square. The beans in 1 metre by 60 cm, the spinach in 1 metre by 40 cm, and the radish along in 1 metre by 30 cm. Once we’ve marked out the rough size of the plots, you should remove all the weeds, being especially careful to remove the deep rooted ones like dandelions and thistles, and those which spread rapidly like couch grass, bind weed, and creeping buttercup. Plant 9 green beans in each bean plot, so 18 altogether. These are climbers and need poles to support them. The beans are susceptible to frost and need to be planted out after the danger of frost has passed. Depending on where you live, you can either plant these straight outside in the ground at a depth of 5 cm when any danger of frost has passed. Alternatively, you might prefer to start them off indoors in pots to plant out in early summer. It’s good to use paper pots or cardboard tubes so you don’t damage the roots when transplanting them, and the containers will just decompose. Polyculture – Make 3 tripods, placed 20 cm from the plot edge and about 30 cm apart. If it is too early to plant your beans out, leave the tripods to mark where you will plant the other crops. 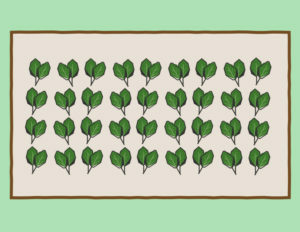 Monoculture – You will plant the beans in staggered rows 20 cm apart. 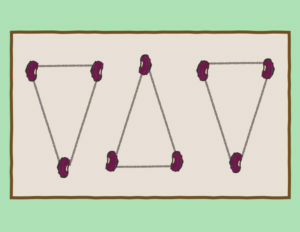 Place canes to join between the rows in tripods with two in the first row and one in the second row together, then two from the second row and one from the first row. See the layout diagram above. There will be 36 spinach plants in each plot. These are planted 1 and a half cm deep. Polyculture – Place roughly 4 around each bean plant, trying to keep them about 15 cm from the beans and about 10 cm from each other. 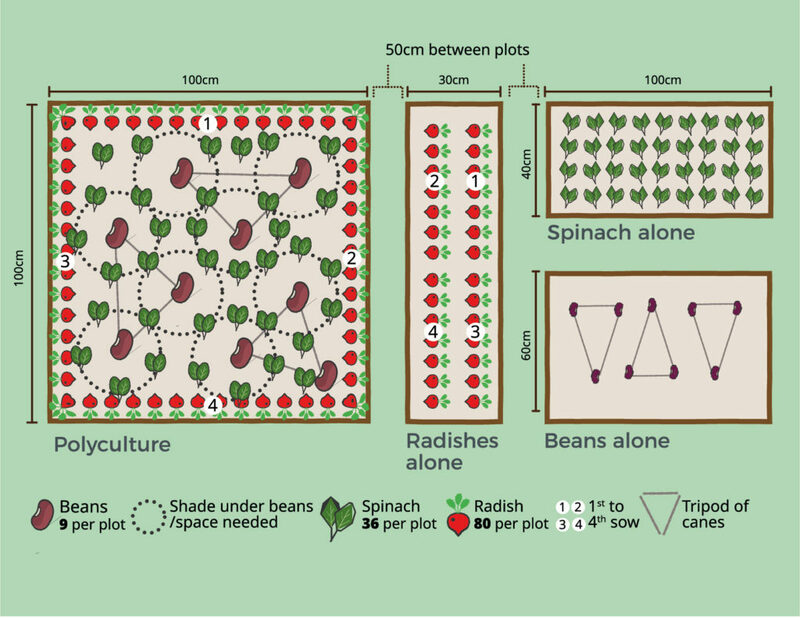 Check the image above for the polyculture planting layout. Monoculture, you will plant them in staggered rows about 10 cm apart. 36 seeds makes 4 rows of 9 plants. 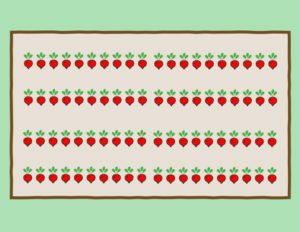 Plant a total of 80 radishes in each plot. They are planted about 1 cm deep. So these don’t all come at the same time, you can plant them in succession every 2-3 weeks. So long as you plant the same number at the same time in the polyculture and the monoculture, you will have a good comparison for the experiment. Polyculture – first plant 20 on the north side, so they get the light before the other crops grow. In 2-3 weeks time, plant on the east side, then 2-3 weeks later on the west and another 2-3 weeks, plant on the south. Planting radish at the edges is sensible because you will be pulling them up after 4-6 weeks to harvest them and you want to minimise the disturbance to the other crops when you do this. Monoculture – Plant in two rows of 40 seeds. You’ll start on the north-east side and plant the first half a row of 20 seeds the same day as you plant the north side of the polyculture. Then plant the north-west, south-east and south-west at the same time you plant the east, west, and south sides respectively in the polyculture. Over the coming weeks, you can look for the emergence of your seedlings. Make sure that they get enough water – don’t let the ground dry out or get too wet.